Are you a Hunger Games fan? For me, Harry Potter will always be #1, but I have to admit, I really, really liked Catching Fire. It was cast very well (Josh Hutcherson, Jennifer Lawrence, and Liam Hemsworth…you can’t go wrong with them), the special effects were great, and I may or may not have been very excited when French macarons were served at a party in the Capitol. If you haven’t seen it yet, I highly recommend it! It was even better than the first; so good, in fact, that I saw it twice over Thanksgiving break (something that I never do). So, what did I do this break when I wasn’t seeing movies? I did a lot of cooking, but like I mentioned in the last post, some of it didn’t turn out very well. These tacos, though, are great! 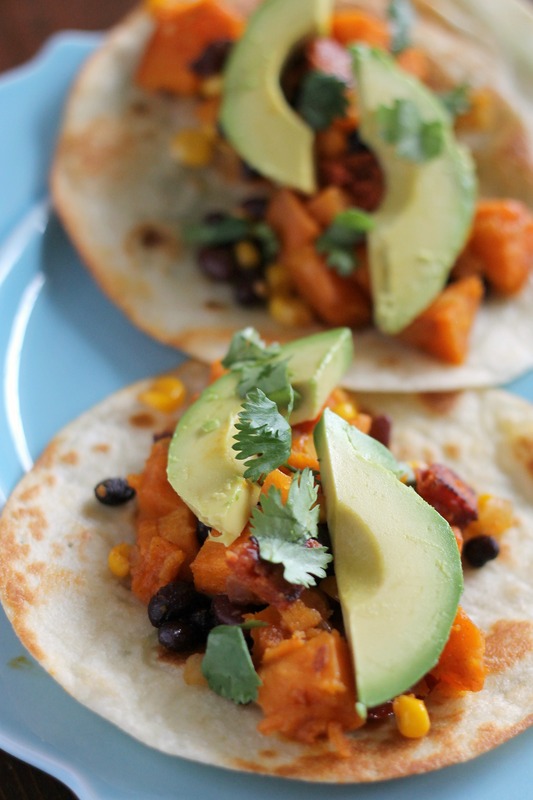 I know the thought of eating sweet potato in a taco may sound a little bit strange, but it actually really works. We added chorizo to our tacos, but I am sure that they would be delicious without the chorizo as a vegetarian option. They are very filling and make a great (somewhat) healthy meal! Preheat oven to 425 degrees. Line a rimmed, medium-sized baking sheet with foil. Place the sweet potatoes on the sheet and drizzle with 3 tbsp of olive oil; toss to coat. Sprinkle with cumin, paprika, coriander, cayenne pepper, salt, and pepper and toss to coat Bake for 15-20 minutes or until tender, stirring once halfway through baking. Meanwhile, in a large skillet, heat remaining 1 Tbsp olive oil over medium-high heat. Add onion and saute until golden brown and caramelized, at least 5 – 6 minutes, stirring in the garlic at the end. Reduce heat to medium-low and add the drained black beans, corn, honey and lime juice. Heat until warmed through. 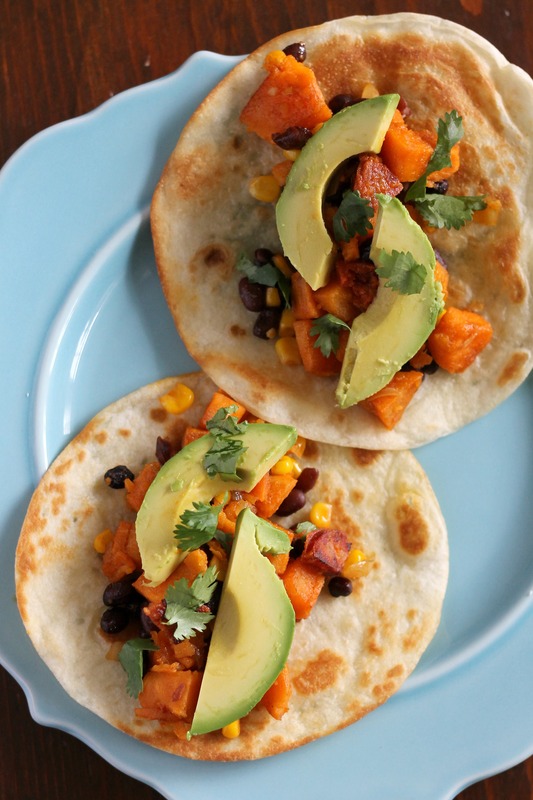 Toss in roasted sweet potatoes and cilantro. Serve on warmed tortillas with desired toppings. Enjoy! Note: If you would like to add chorizo to this, pan-fry about 3 ounces of chopped chorizo until browned. Stir into the bean and corn mixture.